Like many, I like to take advantage of free (and reduced price) ebooks offered through sites such as Bookbub; it’s a good way to discover new (to you) author. The Gauguin Connection, by Estelle Ryan, popped up last year on Bookbub as a free ebook. I’m a fan of mystery/thriller/suspense novels, and this one had a rather intriguing premise: an art investigator who was also a high-functioning autistic. A good friend of mine is also high-functioning autistic, so I was curious to see how this condition would be woven into a story. The Gauguin Connection introduces Dr. Genevieve Lenard, an autistic art investigator for an insurance company in France. She is sucked into a murder/theft/forgery case when a college girl is found murdered, and a piece of a famous Gauguin painting is found on her body–the same painting that is insured by Genevieve’s company. Genevieve uses both her investigative skills and her astuteness at reading body language to solve this case and many others to which the murdered girl was connected. Genevieve’s character, by dint of her autism, relies heavily on body language in order to function adequately in society. She doesn’t understand slang, colloquialisms, or sarcasm, to the frustration of most who meet her. She also has a limited filter, and often speaks her mind with no concern as to whether or not someone’s feelings (or ego) might be hurt. I found myself laughing aloud at the character’s bluntness; she reminded me a bit of myself, many years ago (no autism, just a tendency to speak without employing diplomacy :D). Autism is not a laughing matter, but Ryan wrote Genevieve in a way that allowed the underlying humor of her remarks to shine through. Plus, I’m a smartass, so I appreciated Genevieve’s responses to asinine questions and replies. I was also fascinated by Genevieve’s interpretation of body language as a means of assimilating in society. It is often said that most communication among people is nonverbal, and this book reiterates that. I picked up some interesting kinesthetic clues that bear further study, and it made the story even more interesting. The book may have been a bit heavy-handed on the whole “socializing Genevieve” concept, along with a couple of stereotypical characters (e.g., the overstressed, focused lawman intent on pursuing justice; the lawman and criminal who constantly outwit each other, yet have a grudging mutual respect). 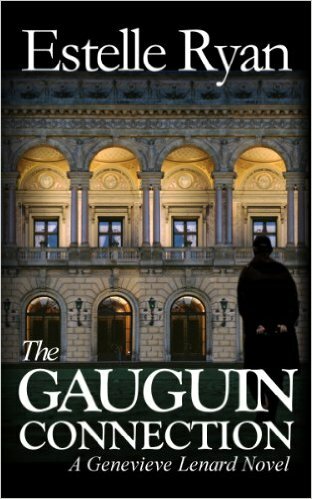 Still, I found The Gauguin Connection to be an entertaining read, and I already purchased the next book in the series (which is up to eight books, so far).